It's made out of Plain Old Felt. Maddie wants to be a Cat for Halloween. Excellent. I can do that. Overalls? Red shirt? Hat? Mustache? Cool. I can do that! Ah, again. A flatcap sort, then. And a tutorial! Most excellent. Okay, then. 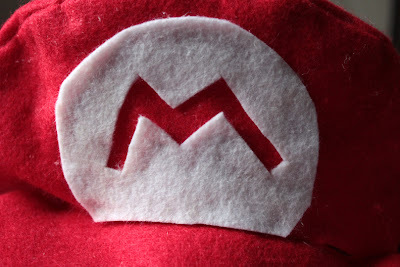 Here's my super-easy, inexpensive four sheets of red felt adaptation for Mario's hat. 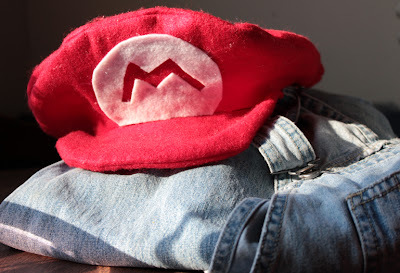 I used red felt, an itty-bit of white felt, red thread, and a hot glue gun with glue. The brilliant inventor of my hat I was making suggested at least a 12 inch diameter. So that's where I started. My sheets were 11 1/2 inches at their longest side, as I mentioned. So I figured I'd need a little extra something at the front of the cap, for it to stand up tall, bearing that identifying M.
Another factor was that I preferred that the seam went across the middle sideways, instead of visibly (obviously) from back to front. So I sewed two sheets of felt together, along the long side. And then the same with the second set. Stacked one over the other. 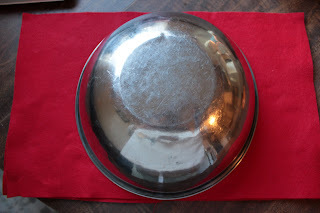 I found a bowl in the cupboard that brushed closely my edges. .. Marked my circle on the fabric, the scooted the bowl over two or three inches towards one outside edge and marked it again, allowing for more room for the top (extra height) of the hat. I cut out both pieces of felt at the same time, following the outer circle. I took a piece of non-stretching twine, and while Trev was sleeping :) I wrapped it around his head and cut it at the point where it met snugly with the end. Since it was twine, and twisty, I found something in the kitchen (a lip of a bowl) that was pretty much exactly the size of the cut piece of twine. 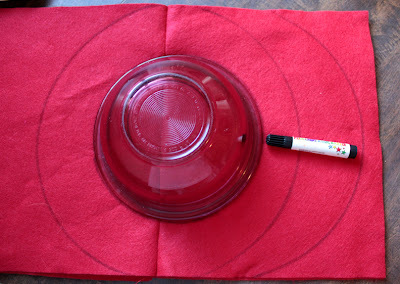 This is a photo of the twine lying loosely around the bowl. So, now on the bottom felt piece, I traced that bowl in the middle of my original circle. Note: This turned out alright for me, as my children don't like hats or uncomfortable things on their bodies, but someone else might be better off choosing to down-size that cut hole. If you'd like a snug fit, then choose something two inches (more or less) smaller in diameter than your string for marking your 'head' hole. Sew the outside edge of the bill. 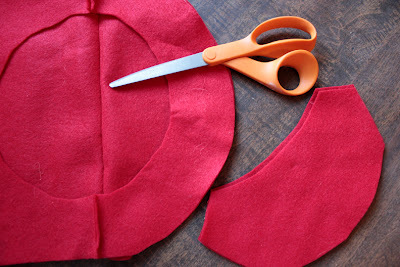 Sew the bill to the front (tallest, longest section) of the cap. and hot glued the white piece of felt over the bill of the cap. That turned out fantastic! Great job! That is too brilliant!!! Perfect!!! Well done!!! 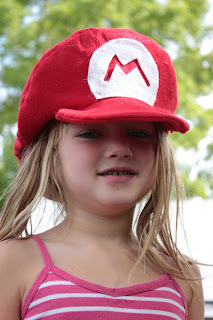 Adorable, and the hat is great too! Pretty good looking Mario hat! I can't wait to se the whole deal. You are pretty clever! 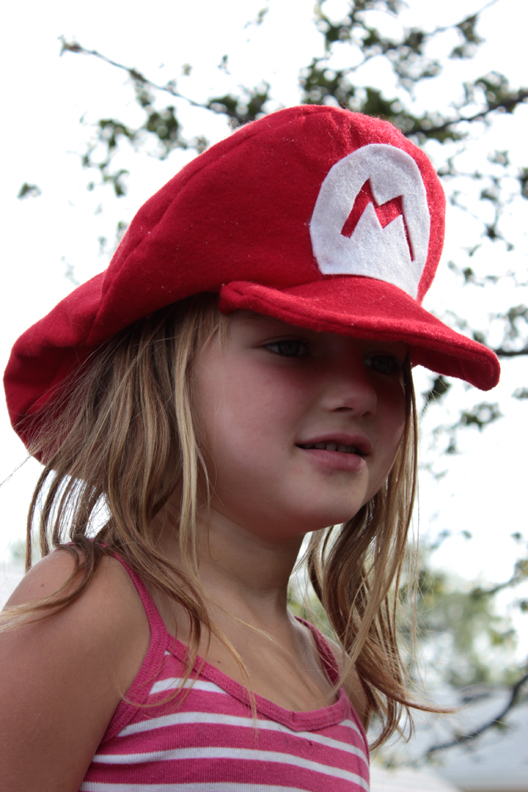 Also feeling lucky we don't go in all at Halloween here in Oz...my kids would have crap costumes LOL! !